“We read and perform Shakespeare because, at this particular moment, this play speaks to us as no other play can or will; because we have a hunger to create and share this particular event with other human beings.” With this underlying premise, the author shares his experience, insight, and philosophy regarding the ephemeral nature of acting-creating a presence on stage that is as profound in its depth as in its practicality. 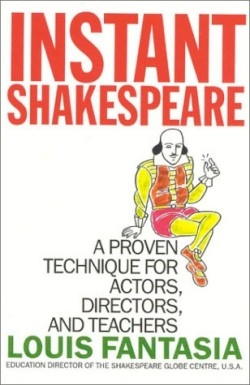 The incongruous nature of the words Instant and Shakespeare make the title sound like a twenty-first century “quickie” approach to the venerable Bard. “Ay, there’s the rub!” The title belies the true nature of the lessons and ideas in this work. Actors, directors, teachers-anyone with an interest in Shakespeare-will gain insight into the plays, and into acting in general, from reading this work. In addition to the text, the author’s thoughts about which Shakespearean texts are most useful and his list of sources are a great resource. It is difficult to recall the last book that offered as much as Instant Shakespeare.